The first NZXT case I used was way back in 2006 when I built an AMD based PC using the fastest chip available on the market – the AMD Athlon X2 4800+. 8 years ago that was a dream machine and the chassis I used to house the most expensive computer I ever bought was the NZXT Lexa. To me it stood out as one of the sexiest looking cases on the market and I was damn proud to show off the case to friends and family. Of course case design was just coming into its own back then. So instead of routing cables you simply jammed them into the open 5.25” ODD bays and power supplies were still located at the top of the case making your processor run hot. Despite these ancient issues, the NZXT Lexa is still one of my favorite cases. Since that time I have followed NZXT’s designs and while I haven’t always liked all of the cases they have released I respect the company for trying new things and never releasing a case that is a copy and paste of a popular chassis design. The latest original piece to come from the NZXT development team is the H440, which takes all of the sleek designs of the H series cases and adds features that are not typically seen on other cases. The first feature that really needs pointed out is this case is completely ODD free. You won’t find any 5.25” drive bays, just a solid front chassis with three cooling fans. I have long proclaimed optical drives are quickly going the way of the floppy drive. I haven’t used one for a good 3 years, but I have to admit I was taken back when I first saw that the H440 didn’t have any optical drive bays. In a digital era though it is pointless for every case on the market to have ODD bays, if you need a DVD drive get a different case, it is as simple as that, but if like the rest of us you download your games, drivers and digital media then this case will fit perfectly. Now if we could just get motherboard companies to stop putting drives on a disc and send them on a USB flash drive I would be a happy man, but that is for another day. The NZXT H440 also comes with completely new fans, dubbed FN V2.1. These fans are able to push more air at a lower decibel level then the previous generation, so they are more efficient and create less noise. Out of the box the H440 comes with four of these new fans, 3x 120mm at the front and an additional 140mm fan at the back. With three fans pulling in air from the front the NZXT H440 should have excellent cooling performance, but it is also built to be quiet. All the four panels on the case (top, front, and sides) have sound damping foam on them to keep the noise down even when the fans are at full load. 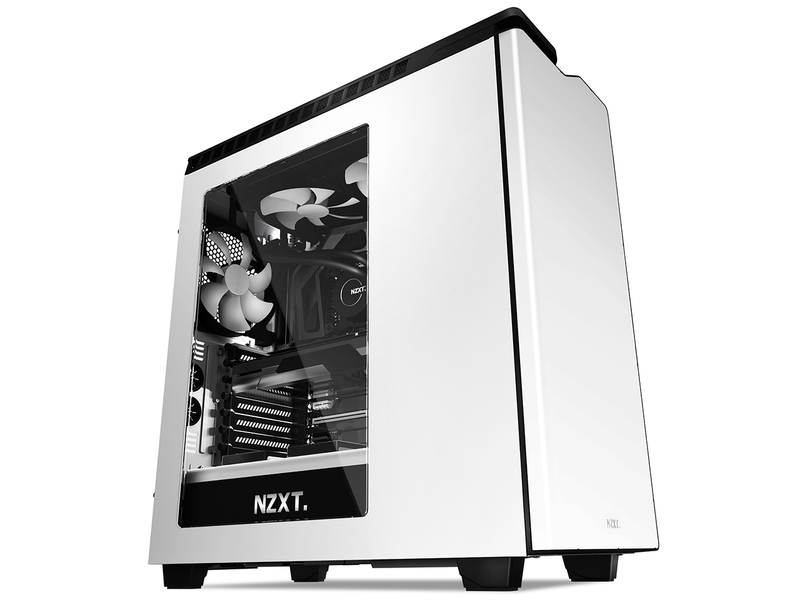 The NZXT H440 will be available this month in either red/black or white/black and it has an MSRP of $119.